Conway Elementary, with 600 students in grades preK–5, is an urban school near San Diego that serves a predominantly Latino community. After a decade of literacy scores that lagged well behind district and state averages, Conway leaders knew they needed a change that would make an impact. In 2015 they adopted the EL Education school design. Within three years, Conway closed the gap between its scores and the state’s, not only for the general population, but also for economically disadvantaged students. The school simultaneously reported the lowest suspension rate in the district. The secret to Conway’s turn-around? The EL Education model integrates character and academics, enabling teachers and leaders to establish a strong culture of student engagement and achievement. Prior to implementation of the EL Education model, only 14% of Conway’s students in grades 3–5 tested proficient in English Language Arts (ELA) on the California Assessment of Student Performance and Progress (CAASPP), as compared to 28% of students in the district and 41% of students in grades 3–5 statewide. In the two years following the start of implementation, Conway posted a 27-point gain, catching up to both the district and the state. Economically disadvantaged students in grades 3–5 at Conway made similar gains in ELA proficiency, increasing from 12% to 38%, a 26-point gain. Over the same time period, economically disadvantaged students in the district made just an 11-point gain; their peers across the state made just a 4-point gain. As a first step, school leaders sent the entire Conway faculty to the 2015 EL Education National Conference in San Diego. Teachers returned from the conference inspired to embrace EL Education’s approach to student achievement. Recognizing in particular the role that character plays in students’ mastery of knowledge and skills and their ability to produce high-quality work, teachers and leaders identified four norms, or character traits, that students strive for in class and in the hallways. These EPIC norms—Excellence, Perseverance, Integrity, and Compassion—guide all interactions in the Conway learning community. In professional learning sessions facilitated by an EL Education coach, one of the first things teachers learned was how to engage students in meaningful discussion about their reading and writing. “Getting our students to talk using discussion protocols and to make meaning from what they read as they learn about the world has completely transformed their learning. They are doing it in every subject, not just ELA, and that has boosted our scores across the board,” said Meglich. Teachers also integrated many elements of the EL Education Language Arts Curriculum into multidisciplinary, topic-oriented studies through which students create authentic products for real audiences. Conway learning expeditions and students’ high-quality work is featured in this video. Meglich emphasized that building a positive culture with students anchored in the school’s EPIC norms “has made it possible for students to do the hard academic work we need them to do. Our discipline data show that suspensions and referral incidents have declined by 75% as students improve< at reflecting on and articulating where they are on the EPIC norms.” What’s more, teacher Lana Brady noted, students are excited about the topics of their learning expeditions and eager to put real-world skills to use in products they can share with the broader community. Encouraged by the success of their first three years, Conway leaders plan to continue creating authentic learning expeditions from the compelling topics in the EL Education Language Arts Curriculum and strengthening school culture through deep attention to character. Teachers report a renewed sense of purpose because they can see the results of their hard work. Families too are excited to see their children succeed and to be active participants in their education. Listen to the story of Conway’s remarkable turnaround and its impact on students, teachers, and families online. 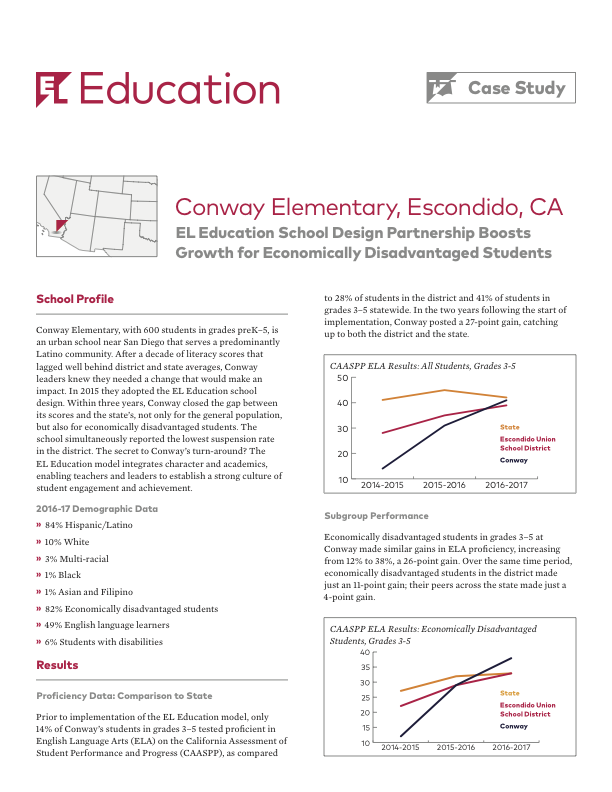 Download the PDF of the Conway Elementary case study here.